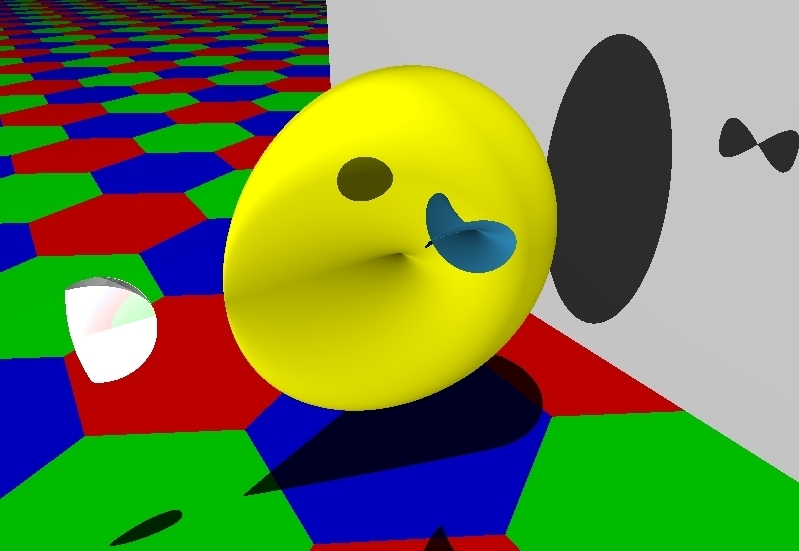 Images rendered by POV-Ray 3.1.
for some range of input values u, v, the image should be a two-dimensional surface in (x,y,z)-space. It's called a Steiner surface patch, but what does it look like? This web site lists all the different geometric types of Steiner surfaces. Usually, graphing polynomial quotients only gives a patch --- a part of the whole surface. The mathematical setting for describing the entire surface is projective geometry. The "real projective plane" is the set of lines through the origin in real 3-dimensional space; when each of these lines is represented by one point, the resulting set is, in an abstract way, a smooth, two-dimensional surface. 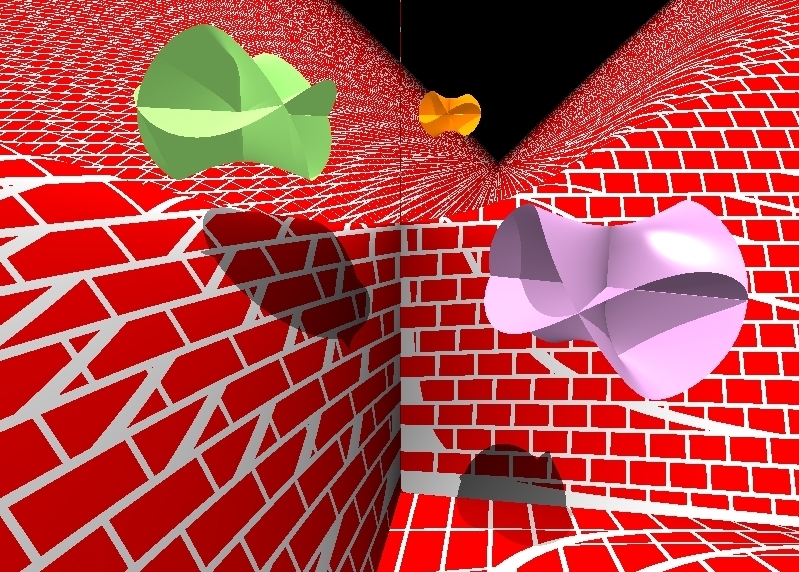 There are many ways to represent this surface as a two-dimensional subset of three dimensional space, and some of these representations were studied by J. Steiner. Here's some background on the geometry of Steiner's images of the real projective plane. A convenient way to assign coordinates to the real projective plane is to pick a coordinate system for real 3-space with axes labeled u0, u1, u2, and denote by [u0 : u1 : u2] the line equal to the set of all scalar multiples of the non-zero ordered triple (u0,u1,u2). So [1 : 2 : 3] denotes the same line as [2 : 4 : 6], and another example is [0 : 1 : 0], which is the u1-axis. This mathematical description of the projective plane is called a "homogeneous coordinate system," and it generalizes to any dimension: real projective n-space is the set of lines through the origin in n+1 dimensions. [u0 : u1 : u2] --> [u02 : u12 : u22 : u1u2 : u0u2 : u0u1]. This surface can be projected into 4-space smoothly, but any projection into three dimensional space must have singularities. Such a projection is defined by multiplying the 1 by 6 vector with a 6 by 4 matrix, so composing the Veronese map with the projection matrix gives four linear combinations pi of these six monomials. 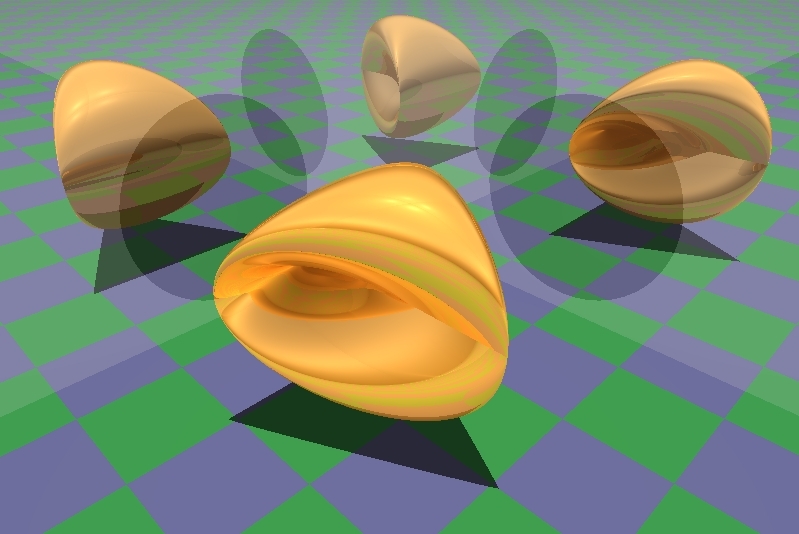 The image of such a parametric map into projective 3-space is called a Steiner surface; examples include the Roman surface and the Cross Cap surface. 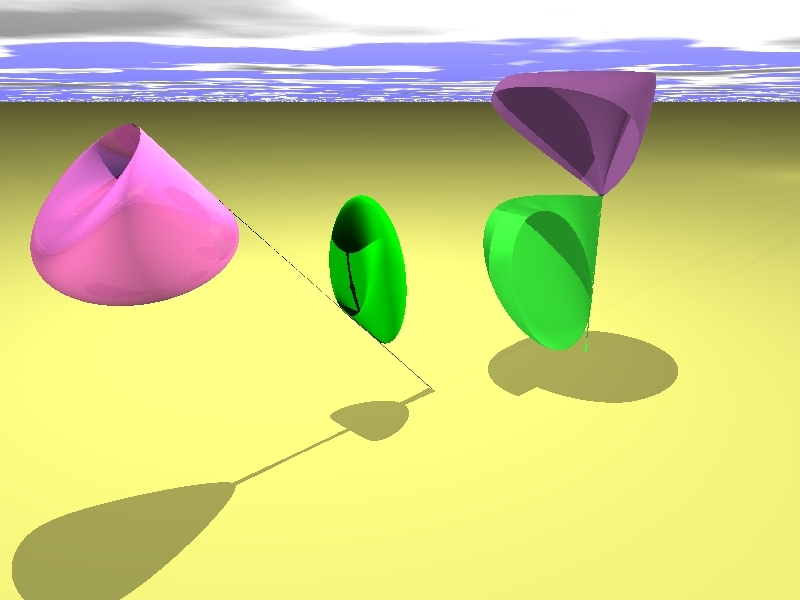 The geometric properties of Steiner surfaces, including the degree and the number and type of singularities, such as pinch points, double lines, and triple points, depend on the projection from five ambient dimensions to three. A. Coffman, A. Schwartz, and C. Stanton, The algebra and geometry of Steiner and other quadratically parametrizable surfaces, Computer Aided Geometric Design (3) 13 (April 1996), 257-286. (x1/x0 , x2/x0 , x3/x0) = (x , y , z) = (p1/p0 , p2/p0 , p3/p0) = (uv/(1+u2+v2) , v/(1+u2+v2) , u/(1+u2+v2)). In fact, this description is just a fancy way to state the original definition of a Steiner surface: the image of three rational functions of two variables, where the numerators are any three quadratic polynomials, and the denominators are equal quadratics. The 24 entries in the projection matrix are exactly the coefficients appearing in the quadratics. The (x,y,z) variables are the usual Cartesian coordinates for three dimensions; this shows how real projective 3-space contains the Cartesian 3-space, as the subset where x0 is nonzero. This subset is called an "affine neighborhood," and the subset defined by x0=0 is the "plane at infinity," where the x1/x0, etc., fractions are undefined. The following list of Steiner surfaces represents each equivalence class from the classification theorem, and gives several different ways to describe each object. Starting with a quadratic homogeneous parametrization in [u0 : u1 : u2], a homogeneous implicit equation can be derived. This procedure is called "elimination of parameters," and I used the algebra program Macaulay. Then, the inhomogeneous implicit equation is given, in the affine coordinates x=x1/x0, y= x2/x0, z=x3/x0. There are also parametrizations by trigonometric or other functions, which are more efficient for parametrizing the whole surface, instead of just a patch. 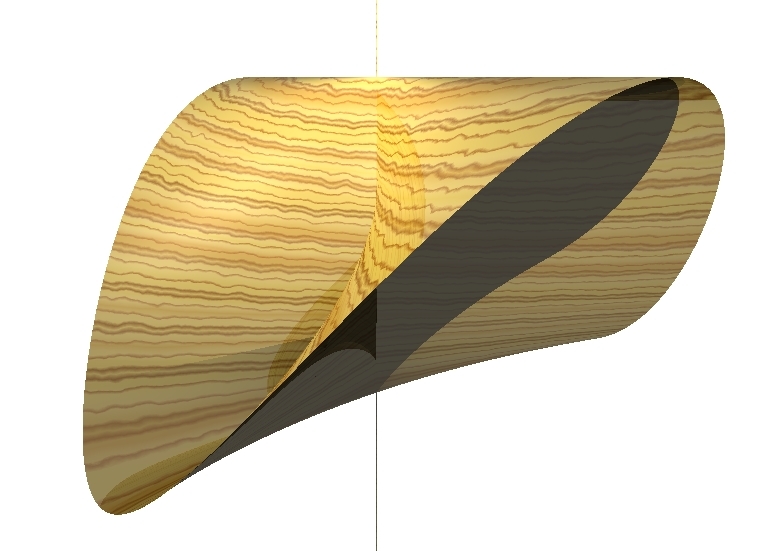 Some of the parametric surfaces have self-intersections along line segments, called double lines. When the parameters are eliminated to get the implicit equation, there are some "extra solutions": points which satisfy the implicit equation, but which do not appear as images of the parametric maps. These extra solutions extend the line segments to infinite lines, and appear as "whiskers" (or "umbrella handles") sticking out of the surface. (In general, if a line meets a quartic at more than four points, then the line must be contained completely inside the quartic.) In the POV code, some of the whiskers have been clipped off, and some are already invisible because the light rays that reflect off the surface miss these lines entirely. I've posted some code, which at least has worked for me, using a Gateway 2000 E-3100 computer. The Maple code worked with Maple V Release 4 Version 4.00b. 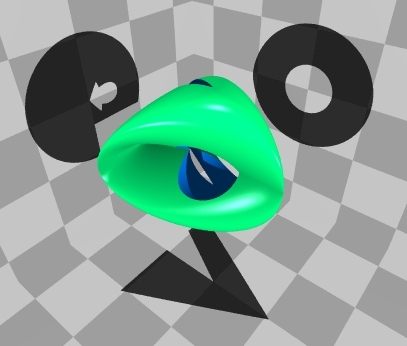 The command with(plots); invokes the Maple graphics package, and then the plot3d, display3d and animate3d can be displayed in a new Maple window where one can rotate, color, and otherwise manipulate the surfaces in space. 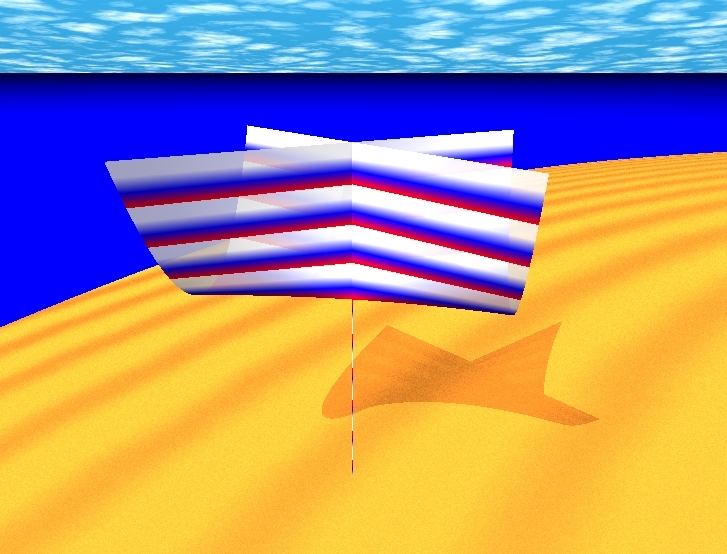 The POV-Ray implementation was based on similar internet graphics galleries, and was developed using POV-Ray™ Version 3.1a.watcom.win32. Click on the small picture to get a larger picture. The code for the larger picture is available as a .txt file. The POV program uses the affine implicit equation of the surface, instead of the parametric plot used by Maple. I would be glad to hear about any use you find for this page, including pictures you make and post to the WWW. I will also entertain questions and suggestions. My email is CoffmanA (at) pfw.edu --- you can acknowledge this resource by citing our CAGD paper or linking to this URL: http://users.pfw.edu/CoffmanA/steinersurface.html --- as of Summer 2018, this replaces some now obsolete addresses at IPFW and Chicago. Steiner's Roman Surface. Three double lines, six pinch points, and a triple point. For a few more images, see my graphics gallery. affine trig parametrization: x=r2sin(t)cos(t), y=rsin(t)(1-r2)(1/2), z=rcos(t)(1-r2)(1/2), 0<=r<=1, 0<=t<=2Pi. 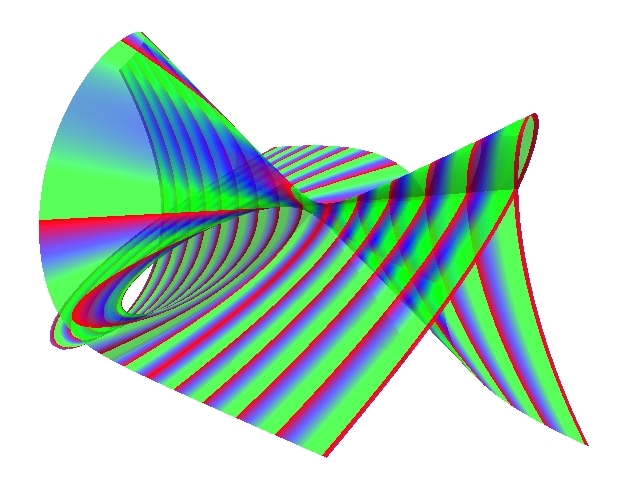 This surface can be transformed into Steiner's Roman Surface, by a complex change of coordinates (transforming x to ix and z to iz interchanges the Type 1 and 2 implicit equations, where i2=-1). It can also be transformed into the Type 3 Cross-cap by a complex transformation, but Types 1, 2, and 3 are not related by any real transformation. It has two real pinch points and three double lines meeting at a triple point, and, unlike the Roman or Cross Cap, is not compact in any affine neighborhood. x=-rcos(t)(r2+1)(1/2), y=-r2cos(t)sin(t), z=-rsin(t)(r2+1)(1/2), r>=0, 0<=t<=2Pi. 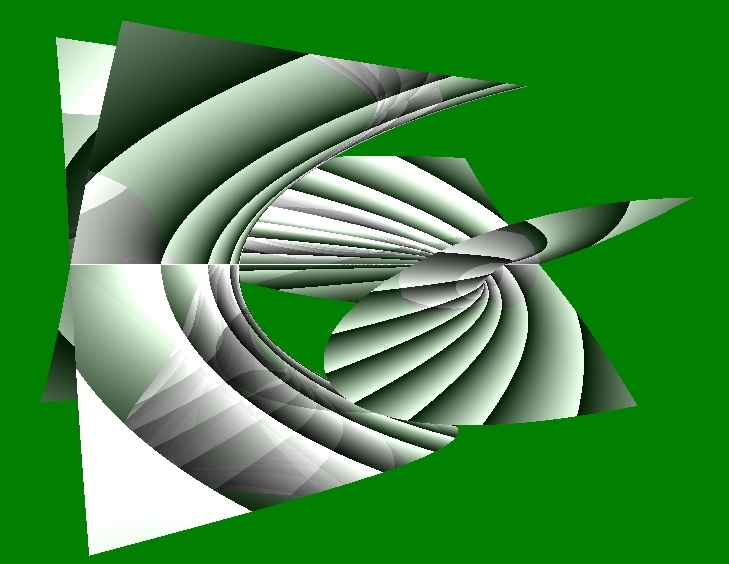 The linear transformation which interchanges the x0 and x2 coordinates gives another view of the Type 2 surface, where two of the double lines are on the plane at infinity. The double line connecting the two real pinch points is still visible in this affine neighborhood. 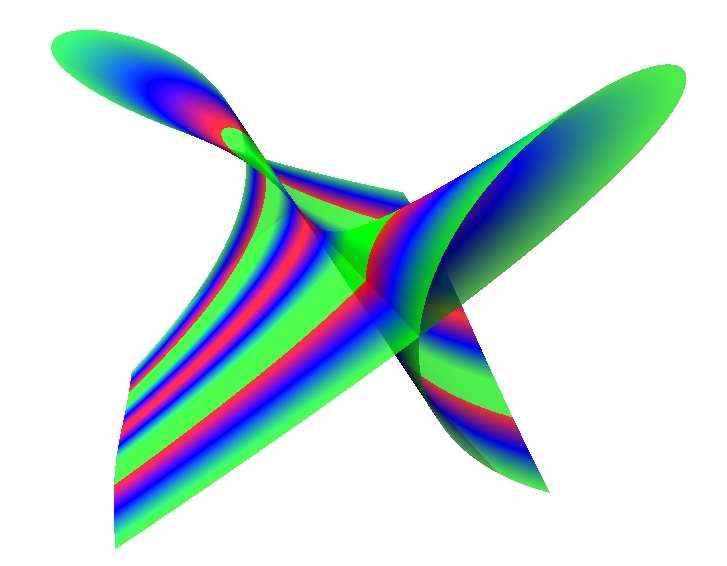 Planes containing this double line intersect the surface along parabolas, so this representation has been called a "parabolic Steiner surface." affine trig parametrization: x=rcos(t), y=sec(t)csc(t)-r2cos(t)sin(t), z=rsin(t), r>=0, 0<=t<=2Pi. Steiner's Cross Cap. (equations from F. Apéry's book) One real double line is visible, but there are also two complex double lines, which would only be visible after a complex coordinate change, resulting in a Type 1 or 2 surface. There are two real pinch points, which curve in different directions (see the patches in the larger picture). It's also known as the Cross-Cap or Crosscap, and the pinch points are also called cross-cap singularities or Whitney singularities. affine trig parametrization: x=rsin(t)(1-r2)(1/2), y=2rcos(t)(1-r2)(1/2), z=-1+r2+r2cos(t)2, 0<=r<=1, 0<=t<=2Pi. Two of the three double lines in the Type 2 surface here coincide, forming a "tacnodal" line, along which two neighborhoods of this noncompact surface appear to be tangent. This line contains one of the two pinch points, and the remaining double line connects the two pinch points. x=1+r2cos(t)2, y=-rsin(t)(r2+1)(1/2), z=-rcos(t)(r2+1)(1/2), r>=0, 0<=t<=2Pi. Two of the three double lines in Steiner's Roman Surface here coincide, forming a tacnodal line meeting the other double line in a "T" shape, and four singularities at the segment endpoints. It is related to the previous surface by complex but not real transformations. affine trig parametrization: x=2rcos(t)(1-r2)(1/2), y=2rsin(t)(1-r2)(1/2), z=1-2r2cos(t)2, 0<=r<=1, 0<=t<=2Pi. The three double lines of Steiner's Roman Surface coincide, forming an "oscnodal" line. I call this type the "Cross Cup," since it resembles the Cross Cap, but with the double line tangent to the surface. affine trig parametrization: x=1-r2+r2sin(t)2, y=r2sin(t)2+2r2sin(t)cos(t), z=((1-r2)/2)(1/2)r(sin(t)+cos(t)), 0<=r<=1, 0<=t<=2Pi. 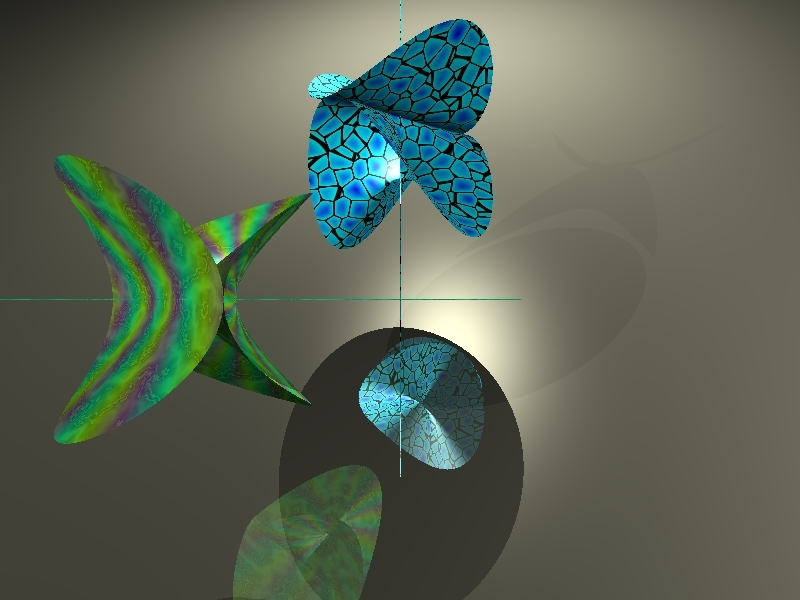 Quadratically parametrized surfaces can also have cubic implicit equations. The surfaces turn out to be ruled by lines. There are trigonometric parametrizations, but also convenient algebraic parametrizations. This cubic surface has a double line and no pinch points. It is sometimes called Zindler's conoid. x=v(v2+1)(1/2), y=uv, z=-u(v2+1)(1/2), u, v real. This ruled cubic has a double line connecting two pinch points. Here are two representatives of Type 8. In this affine neighborhood, only one of the two pinch points is visible. The other is "at infinity." This affine variety is the classic Whitney's Umbrella. There is another image on my graphics gallery page. affine quadratic parametrization: x=uv, y=u, z=v2, u, v real. The linear transformation which changes the x0 coordinate to x0-x3 shows both pinch points in the x0=1 affine neighborhood. The surface is called Plücker's Conoid. affine algebraic parametrization: x=u(1-v2)(1/2), y=uv, z=1-v2, u real, -1<=v<=1. Cayley's ruled cubic has a double line and a singularity called a "unode," which is not a pinch point. affine cubic parametrization: x=u-v, y=uv, z=u2v, u, v real. The linear transformation which changes the x0 coordinate to x0+x1 gives another view of Cayley's ruled surface. affine rational parametrization: x=(z2-y3)/(yz-z2), z and y-z nonzero. affine trig parametrization: x=2rsin(t)(1-r2)(1/2), y=2rcos(t)(1-r2)(1/2), z=1-2r2, 0<=r<=1, 0<=t<=2Pi. For a few more (projectively inequivalent) quadric surfaces parametrized by quadratic polynomials, see the page affine surfaces. The main theorem in our paper on Steiner surfaces is that the above possibilities are essentially the only ones. 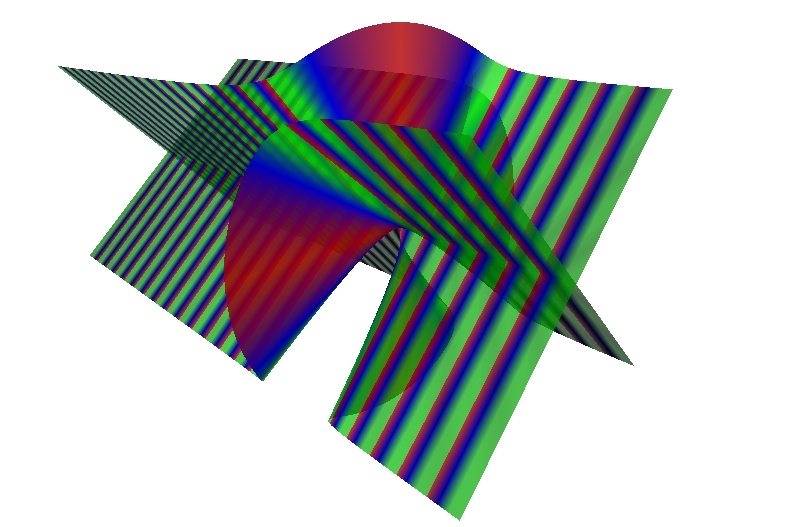 A surface parametrized by homogeneous quadratic polynomials is either one of the types 1-9 above (the parametric map is related to one of the above examples by some real projective linear change of coordinates), or it is contained in a quadric surface, or it is a projection into two or fewer dimensions, so the image is contained in a plane. The complex classification, which was previously known, gives fewer equivalence classes: (1,2,3), (4,5), (6), (7,8), (9), and the quadric and lower-dimensional cases. POV include file: a .txt file summarizing the implicit equations used in the above graphics, in POV format. The Steiner Roman Surface, rotating around one of its double lines. The Steiner Cross-Cap Surface. The linear transformation(x0,x3) --> (cos(t)x0+sin(t)x3,-sin(t)x0+cos(t)x3)is just a rotation of the (x0,x1,x2,x3) space by angle t, but as the animation cycles, the right edge of the surface meets the "plane at infinity," x0=0, and then re-appears on the left. All the frames show a Type 3 surface; they are equivalent under the linear classification, and look different only because the choice of affine neighborhood is changing. Several different Steiner surfaces. 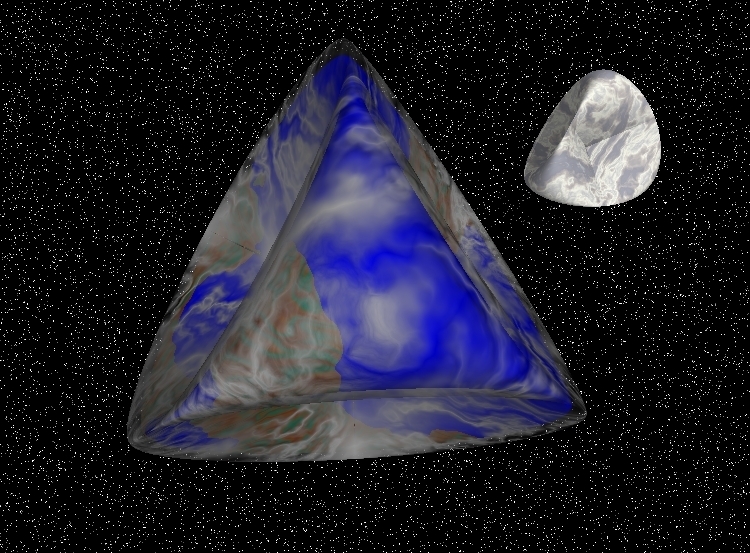 Unlike the above two, which were different views of the same object, in this animation, the object is deforming from one type of Steiner surface to another. The idea is that Types 1, 2, and 3 are stable under perturbation of the parametric equations, and that the Types 4-10 are unstable intermediate cases. In the following equations, the time-dependent quantities are p=cos(t)/sqrt(3) and q=sin(t), 0<=t<=2Pi. The variety is a sphere when p+q=0 (two solutions for t, so two frames), a Type 5 when p=q or p=0 (four frames), and a Roman or Cross-Cap surface for all other values of t. Note the similarity of the homogeneous parametrization with the previous section's equations for Types 5 and 10. Here's some Maple code, showing some of the frames in this loop, parametrized by real numbers e instead of the periodic functions p(t), q(t). Varying the parameter egives a Cross Cap for e < 0, the sphere for e = 0, the Cross Cap again for e between 0 and 2, surface #5 when e = 2, and the Roman Surface for e > 2. 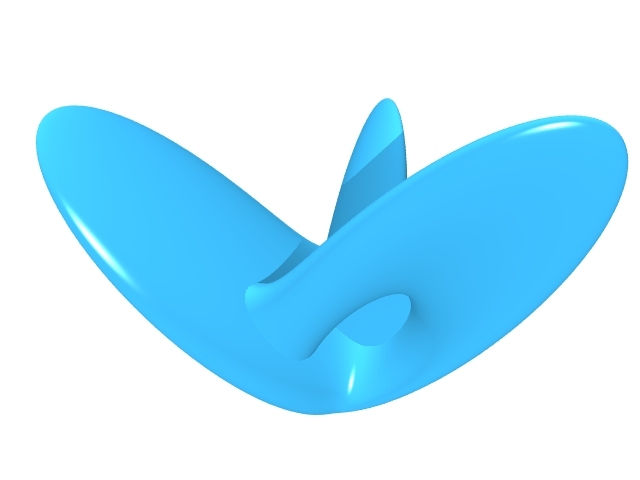 Another deformation of Steiner surfaces. As in the previous animation, the coefficients of the parametric equations depend on another parameter t, 0<=t<=2Pi, and most of the surfaces are either the Type 2, which is not compact in any affine neighborhood, or the Cross Cap, which in this affine neighborhood appears as two components that could be separated by a flat plane. The quantities p=cos(t)/sqrt(3) and q=sin(t) are used again in the following equations. When p=0 (for two frames), the equations define a hyperboloid of two sheets, and when p+q=0 or p-q=0 (for four frames), the surface is a Type 4. The Boy Surface is named after Werner Boy, who discovered this immersion of the real projective plane in three dimensions. It can be realized as a real algebraic variety of degree six, unlike a Steiner Surface which has degree at most four. It has a triple point, like the Roman Surface, but no pinch points. 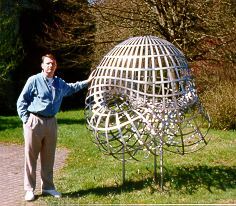 The photo shows the sculpture at Oberwolfach. The animation demonstrates F. Apéry's homotopy, where the equations of the surfaces depend on t, 0<=t<=1. The parametric equations are fourth degree, except that at t=0, the (u02+u12) quantity can be canceled from each of the four components, so the t=0 surface is a quadratically parametrized Steiner surface (Type 1). The implicit equations are sixth degree, but again at t=0, the polynomial factors into a Steiner quartic and z2. The z2 factor defines the xy-plane, but it is not in the image of the parametric equations --- it's a locus of extra solutions from the implicitization, just like the whiskers in the still pictures, and it is not included in the animation sequence. The image of Apéry's quartic parametrization of Boy's surface is the t=1 sextic variety, without any extra implicit solutions. F. Aries, E. Briand, C. Bruchou, "Some covariants related to Steiner surfaces"
F. Halter-Koch and G. Lettl, "Polynomial parametrization of systems of Diophantine equations"
T. Nordstrand, surface gallery, in particular, ray-traced Steiner surfaces of types 1, 2, 3, 4. A. Coffman, A Classification of Quadratically Parametrized Maps of the Real Projective Plane, B.S. Honors Thesis, University of Michigan, Ann Arbor, 1991. Re-typeset, added update sections, and posted online in 2018: 37 pages + 10 Figures. A. Schwartz and C. Stanton, Classification of Steiner Surfaces, unpublished notes from 1988, available from me on request.